139 color + 56 b-w illus. Graffiti written in storm drain tunnels, on neighborhood walls, and under bridges tells an underground and, until now, untold history of Los Angeles. 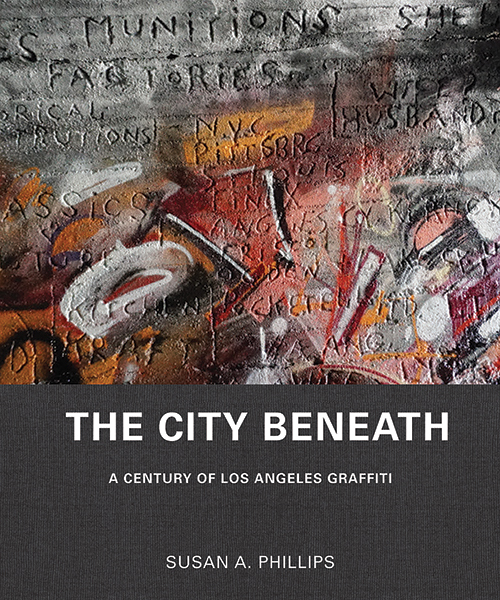 Drawing on extensive research within the city’s urban landscape, Susan A. Phillips traces a secret language of marginalized groups over the past century—from the early 20th-century markings of hobos, soldiers, and Japanese internees to the later inscriptions of surfers, cholos, and punks. Whether describing daredevil kids, bored workers, or clandestine lovers, Phillips profiles the experiences of people who remain underrepresented in conventional histories, revealing the powerful ability of graffiti to create shared community. Graffiti aficionados might be surprised to learn that the earliest documented graffiti bubble letters appear not in 1970s New York but in 1920s Los Angeles. Or that the negative letterforms first carved at the turn of the century are still spray painted on walls today. With discussions of unsung heroes like Leon Ray Livingston (a.k.a. “A-No. 1”), credited with consolidating the entire system of hobo communication in the 1910s, and Kathy Zuckerman, better known as the surf icon “Gidget,” this lavishly illustrated book tells stories of small moments that collectively build into broad statements about power, memory, landscape, and history itself. Susan A. Phillips is professor of environmental analysis at Pitzer College. She is the author of Wallbangin’: Graffiti and Gangs in L.A. (1999) and Operation Fly Trap: Gangs, Drugs, and Law (2012).